The advanced technology of reading materials by computer, Kindle and even cell‐phone devices help people easily access to information even way much more than what library could provide in last decades. Therefore, the main function of library seems to have a change in order to accommodate the current trend of getting and providing information. As for designing a new library in this era, our design concept is to agree that people are in need of finding places to sit and get relaxed for getting information from books, magazine, articles, etc. 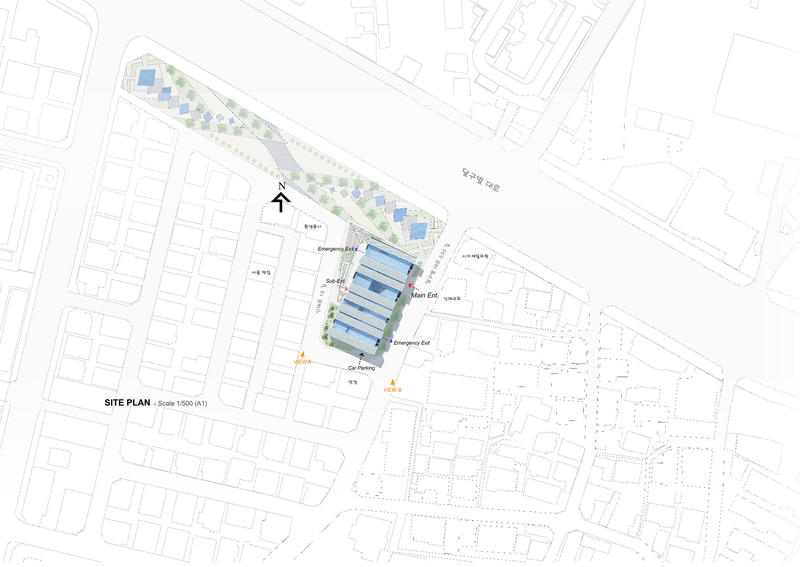 Thus, the expanded program for the local community by providing classrooms, and exhibition area, lecture room, semi‐private reading areas, digital data corner, etc. will be another major change in current library system. We believe not in a dramatic way but strongly the new design of space that should convey this change in a way to enhance and motivate public to come and enjoy the use of library. The first ideas we aimed for this library was that it should have private reading area with opened arcade. In order to achieve it, the distance of book shelves each other was developed based on necessary space allocated for people looking for a specific book section and for people who want to take a time to sit and enjoy reading in private. By this arrangement, a unit of book shelves area was created and it is arrayed in a direction to make a form of architecture. Then, it has been horizontally inclined each other to a certain degree by providing enough entrance, book shelves, semi private open reading area one after another. By doing so, its shape seems more naturally formed as books on a shelf. 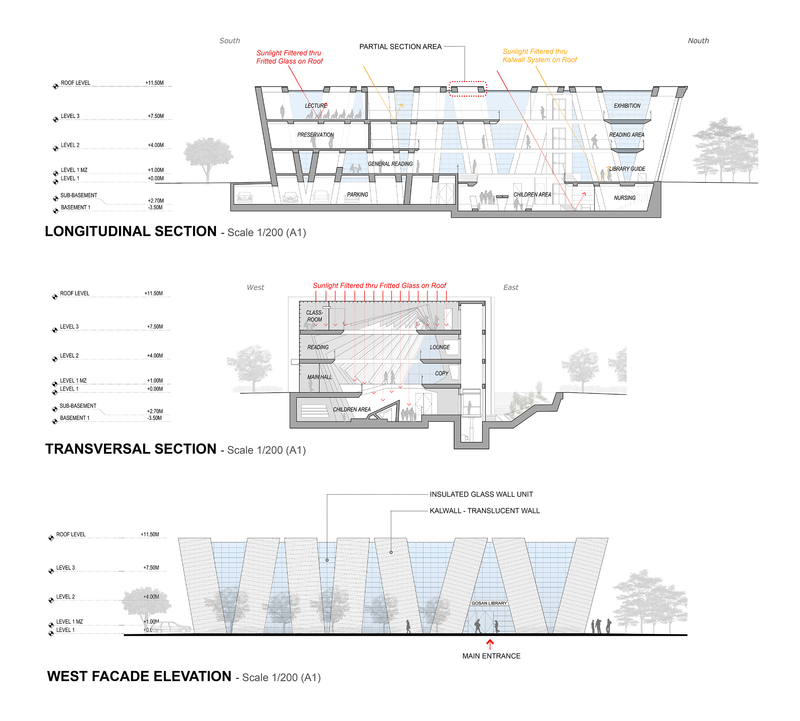 The space that we imagine for the library was all about user friendly, so the space should be well lighten by the sun. Hence, a mass of rectangular is stretched to pass through the each book sections to get a proper opening with lights from the sky. Also, parking lot entry was designed in the same manner. For the better use of this extensive sunlight, we brought Kalwall (transparent wall system) into our main design elements. Its transparency is to get enough brightness from the sun, and at the same time, its heat resistance also good for a climate like Daegu with four distinct seasons. In addition, its easy construction method would be even beneficial for the realization of the project. The structure system we expect is basically reinforced concrete structure. Its structural mega walls (bookshelves walls) act as columns. With floor slabs, they will act as a truss system. 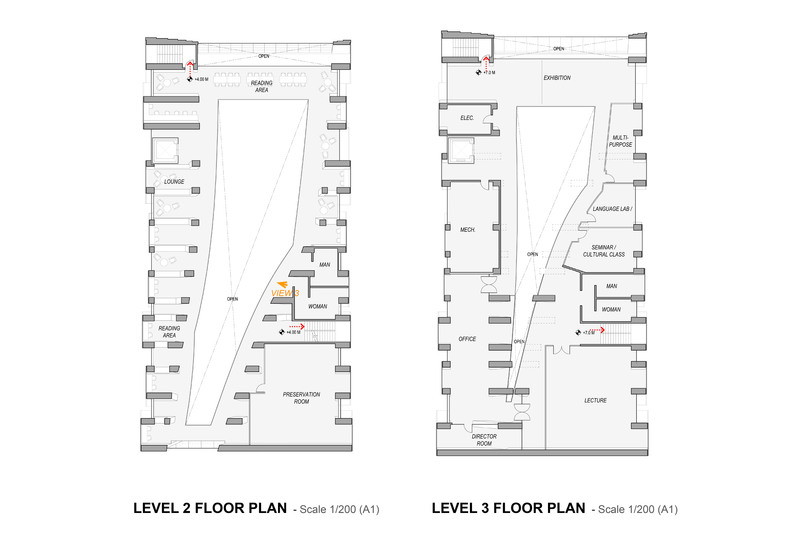 Thus, for the mechanical design, we locate the space on level 3 floor for its easy ventilation. The interior air flow will easily resume from the top floor to circulate air into lower floor which return air will be located. The travel of the air will easily flow from the inner surface of shelves at walls and under the roof area. 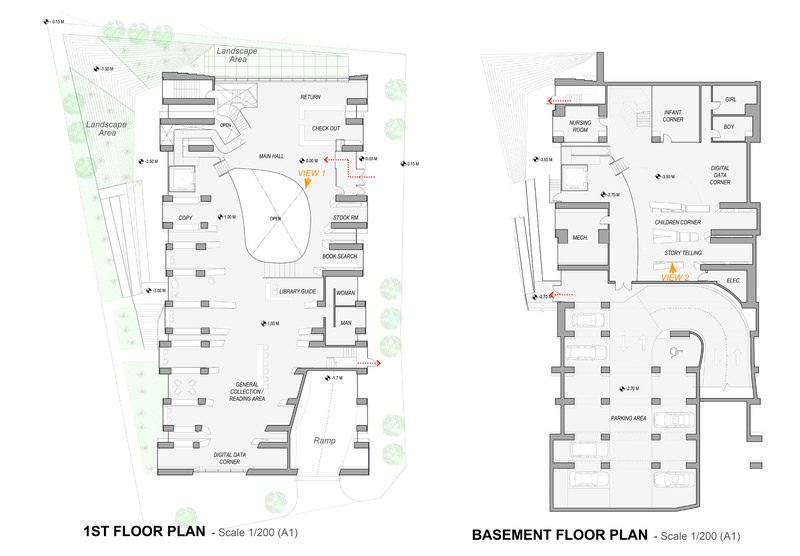 Plus, the opening area from the north to the south will create natural ventilation of interior space. We strongly believe that those sustainable design approaches to this library apparently support the community well with its well lit opened, yet privately separated space, as well as its energy savings.